Do you have out of control leaves or grass clipping clutter? Finally had it with raking, sweeping or bagging? You need a new STIHL blower. STIHL blowers are among the most powerful in the industry, and are designed to save you time and energy. No matter the task, we have something for any job. Choose from our complete line of handheld blowers, backpack blowers, sprayers and shredder vacs. Quickly clear up yard debris with our NEW line of STIHL handheld blowers. Just grab, start and get going. Part of our new line of low emissions handheld STIHL leaf blowers, the BG 86 has all the comfort features you need to work for hours at a time. 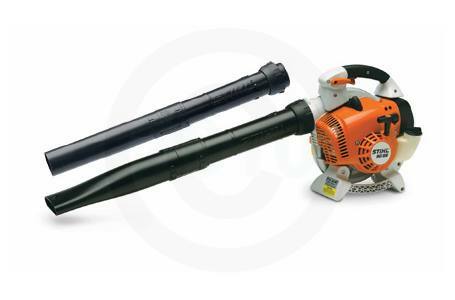 This professional use gas leaf blower is equipped with a throttle lock and stop switch, along with a semi-automatic choke lever for smoother starts and ease of operation. Designed with our four-spring anti-vibration system, this leaf and debris blower is both powerful and fuel efficient— letting you run longer between fuel stops. Protected Spark Arrestor Muffler has large baffles which reduce sound level, and contains a screen designed to reduce the emission of sparks. Easy2Start™ System reduces resistance – eliminating the need for a strong, fast pull of the starting cord. Available on some models. Both flat and round nozzles included. STIHL handheld blowers have many common features. However, all models may not have all the features shown here. Consult your dealer for details.